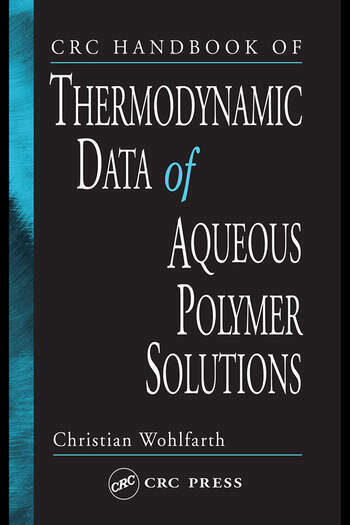 Providing valuable insight on physical behavior of polymer solutions, intermolecular interactions, and the molecular nature of mixtures, each volume in this one-of-a-kind handbook brings together reliable, easy-to-use entries, references, tables, examples, and appendices on experimental data from hundreds of primary journal articles, dissertations, and other published papers. This three-volume set presents hundreds of data sets including VLE/gas solubility isotherms, LLE and HPPE for polymer systems in supercritical fluids, as well as volumetric, enthalpic, and virial coefficient data sets, essential for handling industrial and laboratory processes involving all types of polymer systems. Introduction. Vapor-Liquid Equilibrium (VLE) Data of Aqueous Polymer Solutions. Liquid-Liquid Equilibrium(LLE) Data of Aqueous Polymer Solutions. High-Pressure Phase Equilibrium(HPPE) Data of Aqueous Polymer Solutions. Enthalpy Changes for Aqueous Polymer Solutions. PVT Data of Polymers and Solutions. Second Virial Coefficients (A2) of Aqueous Polymer Solutions. Appendices. Index. Introduction. Enthalpies of Mixing or Intermediary Enthalpies of Dilution. Polymer Partial Enthalpies of Mixing (At Infinite Dilution) or Polymer (First) Integral Enthalpies of Solution. Solvent Partial Enthalpies of mixing Measured by Calorimetry. Partial Molar Enthalpies of Mixing at Infinite Dilution of Solvents and Enthalpies of Solution of Gases/Vapors of Solvents in Molten Polymers from Inverse Gas-Liquid Chromatography (ICG). Table of Systems for Additional Information on Enthalpy Effects in Polymer Solutions. Appendices. Index.